I have had several conversations about chains lately, which means it is time to write a blog. Some folks seemed fairly confused about what actually constitutes a period chain and what doesn’t. My personal definition of period chains relies on actual chains that I have seen in museums, or that I have located in museum databases, or books. With the advent of digitized databases, and Pinterest, there is no longer any excuse for not being able to locate good pictures of actual chains. Most period chains are made of drawn wire. Now drawn wire simply means that they made it themselves – a piece of metal was hammered down in size until it was small enough to be pulled through a draw plate, and this process actually produced wire (this is obviously a simplified version of the process). It is possible to add cast pieces into chains, and using cast pieces as a part of chains is a common practice that goes waaay back. This Roman bracelet from the Backworth Treasure, in England (1st-2nd century AD), is a classic example of a complex chain that includes formed beads on wire links, and a cast piece as part of the chain. But how is a chain made? Well, first you need to have links. 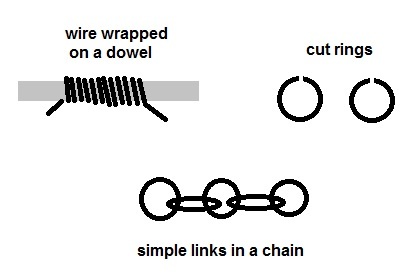 For simple linked chains, the wire is wrapped on a dowel or other mandrel, individual links are cut, and then those links are joined together to form a chain. This diagram shows how a basic chainmail style chain is made. Now something that is VERY important to notice is that the ends of the open links are not pointed. I have never, and I do mean NEVER seen a pre-1600’s chain that had pointy ends on the links. On larger, shaped links, I have seen tapered ends, but we will talk about that later. Modernly many folks feel that the easiest way to produce links to make a chain is with some sort of wire cutter. And what sort of ends does a regular wire cutter produce on wire? Now, largely because this is a very easy way to make a lot of links in a short period of time, I often have crafters argue with me that this should be an acceptable technique to use. OK. The first time someone wears something that is made with this technique, and it ruins their clothes by catching, scratching and tearing at their clothes, how cool is that? Even if your points are not sharp enough to do damage, the look is just not correct if you are trying to make something look really pre-1600s. It is really not that hard to do it the correct way. I remember learning to cut links the correct way a very long time ago. I was working with another jeweler and she wanted to use nicely cut links to teach a class, and it was my job to cut the 500 links. Fortunately she showed me a simple technique to cut the links. This entry was posted in Jewelry, Metal Working and tagged chains, link chains, making chains, making link chains, medieval chains, Viking chains by Eirny. Bookmark the permalink.